Mixed anxiety is a mixture of physical and emotional symptoms and ranges between fear, through nervousness, to overwhelming panic. The physical side of the problem can range from headache, rapid heartbeat, breathlessness, shaking, a feeling of lightheadedness amongst others. Here in the United kingdom (UK) anxiety is a common complaint, and professionals believe it is on the increase. Making your doctor your first port of call for advise can only be a good course of action. Some of the symptoms of anxiety can indeed make you think you are coming down with some dreaded illness such as heart attack (chest pains), stomach pains, even passing out. It is not surprising that people suffering from anxiety visit their doctor’s more frequently than average. The ratio of 29% of Women are more likely to have been treated for a mental health problem compared 17% of men in the United Kingdom (Uk). The figure for men is more than likely to be higher as this percentage does not take into account, those men who have a problem admitting to the problem in the first place. Once you and your doctor are sure your physical health is not at risk talk to him/her about other forms of help before opting for prescribed medication. As I have all ready said stress/anxiety is found in all walks of life, from crossing a busy main road, through the home, and into the work place. Everyone feels tension and has stress in their lives. It is when the tension/stress continues over a long period of time that a problem may arise. Our thoughts alone can be the cause of unnecessary stress. We may dwell on past events, or imagine future ones to be worse than they will be in reality. As you can see from the diagram below, our thoughts go round and round. 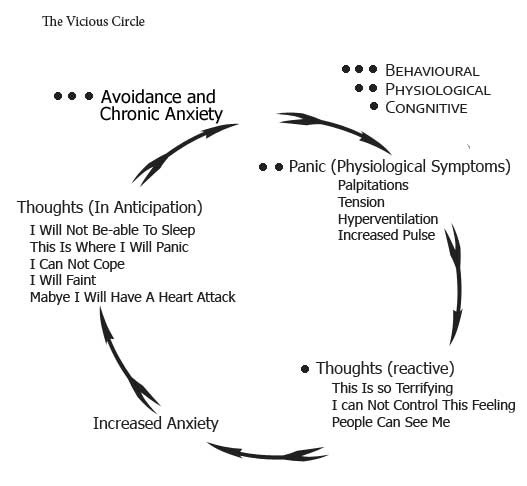 They call this the Vicious Circle/Cycle. When keeping a diary the diagram above can be used to identify the area’s when fear, panic and those recurring thoughts are at their worse.